the first place i went to is known for selling expensive fakes. in case some of you dont know, there are actually different "levels" of fakeness now. its easy to find a $15 chloe paddington, but its also easy to find $250 chloe paddingtons too. the more expensive, the better the quality and duplication -- real leather, correctly stamped padlocks, etc. so anyways, the first place i went to sold expensive fakes and the people there are kinda stuck up. (can you believe that? as if they were the barney's of canal street!) i showed the picture to a blonde asian girl with grey contacts who leapt out of her stool to say, "we had that bag! i just sold the last one the other day! gorgeous bag, studs all over it, but its expensive." 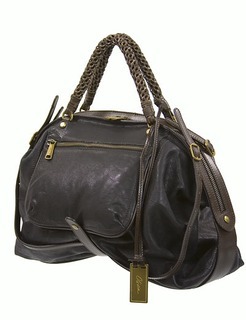 i ask how expensive and she replies, "around 350$ because its a new bag and its a really good copy. real leather, studs, everything! we also have the thomas wylde scarf here too, and its real silk." she slides open a glass case and takes the top off the scarf box, and i notice, nestled in the soft fabric, a price tag with the retail price on it, printed from Barney's New York. sneaky!! she tells me to call her in 3-5 days and see if they get more of the bag in. i thank her and leave to check out some other stores. 3 stands down, i find a place with some impressive fakes hanging on the bag wall and a man and woman sitting in the middle of the room, staring at their laptop, chatting in some asian language im not familiar with. im standing around the back, checking out all the stuff and the lady turns to me to ask if she could help. i take out the picture of the skull bag and i show it to her. she looks at it for a while, and asks me who makes it. i explain some of the details to her when her eyes get all wide and she yells at the guy... "look at the bag! i showed it to you the other day and you said that nobody has heard of it! nobody wants it!" the guy looks at the printout and then turns to me, "is this bag hot? they're selling this bag?" i told him that its becoming a really popular bag, people on ebay are selling fakes for a lot of money, but that i wanted to see a real fake (haha) before even thinking about spending so much money on a replica. he then says, "we have this bag! not in the store, but i can get it! here.. let me find it." he's clicking away on his laptop and pulls up a window with a bunch of pictures of bags and descriptions... scrolling down, he locates the thomas wylde bag. "this is it right?" and sure enough, there it is on the screen, the same images i was now familiar with thanks to ebay. he asks me if a lot of people like the bag and why people like it and somehow i kicked it into salesgirl mode, explaining all the famous celebrities who have it, why its popular, blah blah blah. it all felt so wrong. i was selling fakes... to people who sell fakes. anyways, in the end, they said that if they ordered it, it would take a couple of weeks and to check back. the third and last place i went to was run by an obnoxious and young chinese guy who decided it was necessary to name-drop "we only carry the good bags -- dior, fendi, hermes, chloe, prada, blahblahblah -- and i've never even seen that bag you're talking about." seriously, dude, relax. its not like i was asking you to locate a bag that grandma made out of leftover quilts. i asked to see the dior gaucho bag and he left me around the back of the store into... the first place i went to. apparently he owned both and they were connected, which really explains the nasty attitude of both places. the blondehair/grey-eyed girl was gone, and the rest of the guys just smirked at me, looking at a picture of a bag they had never seen outside of their fendi/prada circle. i never did check back, and even though i'd love to have that bag, it just feels a little silly to spend so much money on a bag that is only replica, even if the real thing is completely unaffordable. i can just imagine the embarrassment, when someone finally realizes that i had spent $250 on a fake. so much money... on a fake?! i dont know... it felt dirty! so anyways... i spent a more than that on the gryson olivia, and i love it. and i can be proud of it and not have to hide all its little tags and zippers and whatnot from keen observers. whew! long entry, but thats it, just wanted to share my chinatown experience with y'all and watch out for the expensive fakes on ebay!